It’s often claimed that racing generates technology that eventually finds its way into everyday road cars. As the old racing maxim goes: “Win on Sunday, sell on Monday.” That’s rarer these days, but automotive supplier Schaeffler Group decided to prove the relevance of racing by stuffing electric motors from Formula E race cars into an Audi RS3 sedan. Schaeffler is the main sponsor of the Audi Sport ABT Formula E team, so the company has access to the appropriate hardware. It took four electric motors from the FE01 race car and stuffed them into the RS3. The motors produce a combined 1,180 horsepower. That makes the 400 hp produced by the RS3’s stock 2.5-liter turbocharged inline-five seem positively timid. Dubbed 4ePerformance, the electric RS3 can reach 124 mph from a standstill in 7 seconds, according to Schaeffler. The company didn’t mention a 0 to 60 mph time, but we reckon the 4ePerformance can do the job a bit quicker than Audi’s claim of 3.9 seconds for the stock RS3. Besides the raw power, the electric RS3 should possess decent agility. Two motors power each axle, giving the car all-wheel drive (this is an Audi, after all) and gearboxes at both axles enable torque vectoring. This means power can be shifted side to side to help nudge the car around corners. 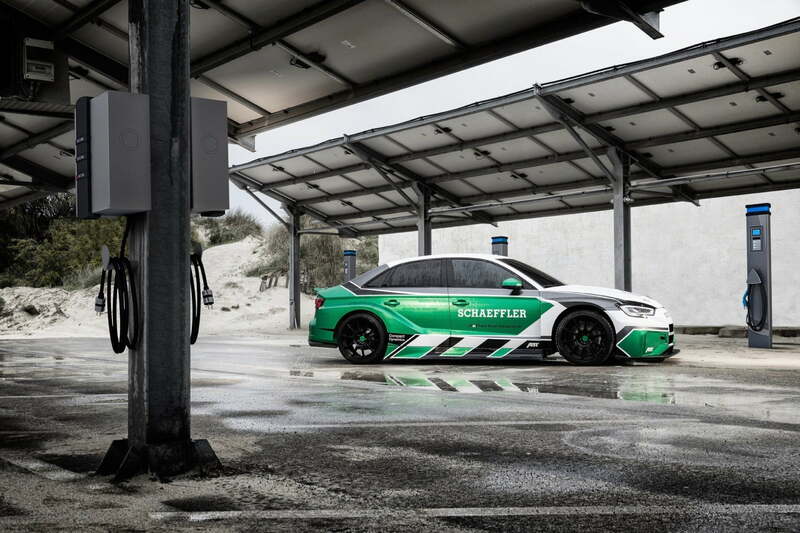 Two battery packs with a total capacity of 64 kilowatt hours power the car, and Schaeffler appears to have used the bodywork from the Audi RS3 LMS race car as well. Audi previously tried to build and market its own all-electric performance car, the R8 e-tron, but production ended after just a few examples were built. The German automaker is now focusing its attention on the more practical e-tron SUV, which is expected to launch later this year. Audi will likely introduce additional all-electric models after that as part of parent Volkswagen Group’s electrification push. Formula E is attracting more manufacturers. The field already includes the likes of Audi, BMW, and Jaguar, with Mercedes-Benz and Porsche set to join the series as well. Nissan will also replace its alliance partner Renault in Formula E. As automakers also launch more electric road cars, Formula E will likely grow in importance as a marketing tool.